This file is part of Tea Light Village, a series of 3 files that will create a tiny 3D village designed to fit over standard LED Tea Lights. This file contains the cutting files for the two-story town home, double-side village shops and two trees. 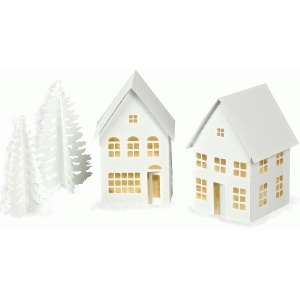 The finished village makes a wonderful Christmas Village for a centerpiece or mantel display. It is an easy-to-do 3D project good for beginners (and experienced users) wanting to try 3D ideas. The file is both Cameo and Portrait friendly. Be sure to also download 3D Tea Light Village Cottage and Barn, and 3D Tea Light Village Church.